Given their influence over the hobby with the publication of Dungeons & Dragons in 1974, it is no surprise that over the last thirty-five years, there have been some five roleplaying games—or supplements and scenarios—based upon the stories of Robert E. Howard. From CB1 Conan Unchained! published by TSR. Inc. in 1984 for Advanced Dungeons & Dragons, First Edition to the latest from Modiphius Entertainment, Robert E. Howard’s Conan: Adventures in an Age Undreamed Of, published in 2017, many are held in high regard, others less so. What they share in common is that they draw upon the life of Conan the Barbarian, the eponymous larger than life character whose adventures would take him across the ancient lands of the Hyborian Age would take him from uncivilised warrior to king. Except in CB1 Conan Unchained! and its sequels, CB2 Conan Against Darkness! and RS1 Red Sonja Unconquered, players do not take the roles of Conan and his companions, but create archers, barbarians, knights, mercenaries, nobles, nomads, priests, pirates, scholars, scoundrels, shamans, witches, and more, who will explore the lands of Hyborea in the long years following the fall of Atlantis. They will fight mighty battles, delve into dark ruins, put a sword to dire sorcery, and more. Now where previous roleplaying works based upon the Conan stories have drawn from the wider canon, Robert E. Howard’s Conan: Adventures in an Age Undreamed Of draws specifically upon the works of Robert E. Howard only. Published following a successful Kickstarter campaign, the roleplaying game uses the 2d20 System, first seen in Mutant Chronicles: Techno Fantasy Roleplaying Game. This is a relatively straightforward set of mechanics which here allow for ‘larger-than-life’ characters and heroic action with an emphasis on that action. Its genre is soundly ‘swords & Sorcery’, but with an emphasis on the swords versus the sorcery. This is because sorcery in the Hyborian Age ultimately involves pacts with dark and evil gods and demons and its practitioners being cursed. In Robert E. Howard’s Conan: Adventures in an Age Undreamed Of it is possible to play a sorcerer, but it takes a great deal of effort and great promises made to often malign intelligences upon the part of the wouldbe sorcerer in his search of power and knowledge. A character in Robert E. Howard’s Conan: Adventures in an Age Undreamed Of is defined by seven attributes—Agility, Awareness, Brawn, Coordination, Intelligence, Mental Strength, Personality, and Willpower. They typically range between six and twelve with higher values being better, but it is possible to have an attribute as high as fourteen. This indicates that a character is a member of an Ancient Bloodline and thus descended from the sunken isles of Atlantis or ruined empires of Acheron. It also marks him out as a potential exemplar—of excellence or depravity. He will also have any number of skills, each defined by two factors, Expertise and Focus. Expertise represents general training, whilst Focus is the disciplined practice necessary to get the most out of a skill. At the end of character generation, skills can have a maximum Expertise and Focus of five each. In addition, every skill has a set of associated Talents, each set arranged in a mini-talent tree. There also are several Talent Trees which are not attached to particular skills. For example, the first Talent in the Melee Talent tree is ‘No Mercy’, which allows a player to reroll damage dice equal to the number of Melee Talents his character has. After ‘No Mercy’, the Melee Talents branch into three options—‘Deft Blade’, ‘Grappler’, and ‘Blood on Steel’—each of which has a Talent after that which a character can eventually have. In some cases, Talents have ranks can be selected multiple times. To create a character in Robert E. Howard’s Conan: Adventures in an Age Undreamed Of, a player takes his character through a lifepath of ten steps, at each step either rolling randomly for or choosing attributes, skills, and Talents. The ten steps are Homeland, Attributes, Caste, Story, Archetype, Nature, Education, War Story, Finishing Touches, and Final Calculations. From his Homeland, a character gets his first language and talent from the choice of thirty available, whilst his Attributes are set at a base of seven, which can then be adjusted according to rolls which determine those which are mandatory or optional. From these a player pick his character’s best or worst attributes. Caste, from Crafter and Escaped serf/Slave to Priest and Warrior, determines a character’s social background, whilst Story—there are six of these for each Caste—starts building a character’s history. Archetype—Archer, Barbarian, Mercenary, Noble Warrior, Nomad, Pirate, Priest/Priestess, Scholar, Scoundrel, and Witch/Shaman—is the nearest that Robert E. Howard’s Conan: Adventures in an Age Undreamed Of gets to the concept of Class a la Dungeons & Dragons, but really are just character types. Nature indicates a character’s personality, Education continues a character’s history, as does the War Story. Finishing Touches enables a player to make some small adjustments, whilst Final Calculations determine various derived values. Throughout, each stage provides various bonuses—Attribute, Expertise, and Focus adjustments as well as Talents—with a player being free to roll for a random result at each stage, choose freely, or mix the two. Of course, most of the stages give a player options to choose from, so the process is not entirely random. The process is of a moderate complexity, but it allows players to create characters which fit particular archetypes or are a mix of skills and talents, that are skilled and capable, and can take action. Advice and suggestions are included though on how to create player characters not quite so over the top and how to bring a diverse group of characters together. This is further supported in the Game Master’s section which examines keeping the player characters together as various group types, like troops or pirates. Our sample character is Sigrid Sharp-Eyed, a Nordheimer whose family was outcast for reasons her parents never told her and whose childhood was one near brush with death after another. Conscripted into one army and mercenary company after another, Sigrid survived battle after battle because she had any skill, but because she had an unnatural awareness of where the safest place on the battlefield might be. After one last bloody one-sided battle, she fled south and has found where she can—thief, thug, guard, and lookout. She has a reputation for being eagle-eyed and a known hatred of authority and military leaders. Robert E. Howard’s Conan: Adventures in an Age Undreamed Of uses the 2d20 System, also used in several of Modiphius Entertainment’s other self-developed roleplaying games, such as Star Trek Adventures and Mutant Chronicles, plus the forthcoming John Carter of Mars and Dune. Simply each time a character wants to take an action, his player rolls two twenty-sided dice, aiming to roll low. This roll is made against an Attribute or against an Attribute plus the Expertise value of a skill. Each roll under this value generates a success. Further successes can be generated if the roll is also under the Focus value of a skill. The number of successes are measured against the Difficulty Rating of the task, one being average. Any successes generated above the Difficulty Rating are counted as Momentum and these can be spent for various effects. These include ‘Create Opportunity’, to provide a bonus die for a subsequent skill test; ‘Create Obstacle’ to increase the difficulty of an opponent’s skill test; ‘Obtain Information’ at a rate of one question per point of Momentum; ‘Improve Quality of Success’ and so more more stylishly; ‘Increase Scope of Success’ to increase the number of targets or area of effect the action affects; and ‘Reduce Time Required’. In combat, Momentum can be spent to gain another action, gain bonus damage, make a called shot, recover from damage, and so on from quite a list of possible actions. When rolled, Momentum need not be spent, but can be saved into a communal pot that any player can dip into. The pot size is limited though, and goes down by one at the end of each scene. So there is an incentive to spend it or lose it. In addition, each character has several Fortune Points. These can be spent to gain automatic successes, additional actions, to overcome Stress or Weakness, or to influence the story. Fortune Points are refreshed at the start of each session, but can be regained for good play, clever plans, teamwork, overcoming challenges, and so on. For example, Sigrid Sharp-Eyed has eventually drifted south where her reputation has found her work in Zamora the Accursed, the city of thieves. She is employed as a guard on the night watch at the fortified villa of Tolmos Gem-Fingered. Of course, she is casing the joint in readiness for a heist of her own, but in the meantime another thief has broken into Tolmos’ vault and is making his escape attempt past near where Sigrid is patrolling. The Game Master asks Sigrid’s player to make a Difficulty 2 Observation test, the difficulty of the task reflecting the skill of the thief. Sigrid has an Awareness of 13 and an Observation of Expertise 2, Focus 2. This means that her player only needs to roll under 15 to gain a Success. Her player rolls a 4 and a 16, giving Sigrid only one Success. Fortunately, Sigrid has the ‘sharp Senses’ Talent, which allows her player to re-roll a die on an Observation test. Her re-rolls the 16 and rolls a 2. This is under Sigrid’s Focus for Observation and so gains her two Successes, for a total of three. Having succeeded at the test, the Gamemaster tells Sigrid’s player that she sees someone slip out of Tolmos’ villa and across an adjacent roof. For the moment, Sigrid’s player decides to keep the Momentum and puts it into the communal pot. Now where the players have Momentum to spend, the Game Master has Doom. She begins each session with her own pot of them, but can gain them through player character actions. These include a player purchasing extra dice to roll on a test, rolling a natural twenty and so adding two Doom (instead of the usual Complication), attempting a Reaction in combat, and voluntarily failing and gaining a Fortune Point in return. ‘Threatening Circumstances’ of the situation and any unspent Momentum rolled by an NPC. In return, the Gamemaster can spend it on minor inconveniences, complications, and serious complications to inflict upon the player characters, as well as triggering NPC special abilities, having NPCs seize the initiative, and bringing the environment dramatically into play. What the Doom and Momentum mechanics do is set up a pair of parallel economies with Doom being fed in part by Momentum, but Momentum in the main being used to overcome the complications and circumstances which the expenditure of Doom can bring into play. The primary use of Doom though, is to ratchet up the tension and the challenge, whereas the primary use of Momentum is to enable the player characters to overcome this challenge and in action, be larger than life. In addition to the standard twenty-sided dice, Robert E. Howard’s Conan: Adventures in an Age Undreamed Of uses Combat dice. These are six-sided dice where only the rolls of one, two, five or six count. In general, they are used as effect dice, for example, in the included scenario, ‘Vultures of Shem’, for every Success rolled for an Observation test when looking for loot on the battlefield, a player gets to roll a Combat die. Primarily though, they are used to roll damage in combat, which can be physical, mental, or social, with characters suffering damage to their Vigour or their Resolve. Here rolls of one and two represent extra damage and rolls of five and six—marked with an eagle—trigger special Effects. So for example, a Farming Flail has four Combat dice for damage and the Qualities, Improvised, Knockdown, and Piercing 1. Improvised means that it does no damage when Effects—or fives and sixes—are rolled, the Effects still count; Knockdown means that a opponent is knocked down if Effects are rolled; and Piercing 1 means that any damage ignore s an opponent’s Soak. Continuing the example above, Sigrid has spotted a dark swathed figure leaving her employer’s villa and making off across the roofs of Zamora the Accursed, the city of thieves. She assumes that the figure is a thief and gives chase, managing to catch up within a moment or two, her aim being to capture the miscreant. As a player character, Sigrid has the Initiative—the Game Master could spend a point of Doom to seize the Initiative, but decides not to—and her player declares that her attack will be to subdue as Sigrid wants to capture the thief. This will cost one Momentum from the group pot. Sigrid’s player declares that he wants her to succeed and in return for adding two Doom to the Game Master’s pot, will roll two more twenty-sided dice. He will be rolling against Sigrid’s Agility and Melee (Expertise 3, Focus 3) skill for a target of 12. The Thief will attempt to Parry using his Coordination and Parry (Expertise 1, Focus 1) skill for a target of 10. This turns it into a struggle. Sorcery covers various traditions, such as Eastern Sorcery, Shamanism, and Witchcraft, but only gives thirteen spells, from Astral Wanderings and Atavistic Voyage to Summon Horror and Venom on the Wind. For the most part, these are not the ‘fire and forget’ dweomers of other fantasy roleplaying games. They take time and effort and great study as well as pledging oneself to a patron. The difficulty of casting spells and the fact that sorcerers are not necessarily immune to the spells they cast means that they turn to other means to build their magical reputations, notably alchemy and animal handling. The first to create petty enchantments such as exploding or blinding powers, talismans, and so on, the second to befriend beasts to aid a sorcerer rather than actually summon one. Overall, Sorcery in Robert E. Howard’s Conan: Adventures in an Age Undreamed Of is challenging and dangerous, but still playable. Our sample sorcerer is a priest of Mitra from Koth, accepted into the priesthood from childhood despite being born under an ill omen. He has been pushed and trained under a rigorous regime, but ostracised and mistrusted. In response, Maurus trusts few people and sought out forbidden areas of research and alternate knowledge. He does not know if this is in response to the poor portents of his birth or fulfilling them. In terms of background, Robert E. Howard’s Conan: Adventures in an Age Undreamed Of provides an introductory gazetteer of the Hyborian World. This is written as if taken from the academic papers that Howard based his stories upon, and as much it introduces the setting, it sets up each of the setting and character supplements to come, so that the section on the lands of the north will be explored in the supplement, Conan the Barbarian, which also explore in detail campaigns built around the barbarian archetype. Altogether, some nine regions and thus some nine supplements and campaign types are prefigured here. A lovely touch is the inclusion of a boxed section of ‘Hyborian Shorthand’, which suggests the historical influences on Howard’s Conan stories. These very simply allow the Game Master and her players get a handle on what each of the various nations in the setting are like. These boxed sections continue throughout the ‘Gamemastering’ chapter, which make the connection between writings of Howard and the writings of H.P. Lovecraft as well as constantly ask what would Howard do if writing a Conan story as much as running Robert E. Howard’s Conan: Adventures in an Age Undreamed Of. From handling the rules to telling stories, player character motivation to environments, elements of Conan adventures to life between adventures—with a particular focus on carousing, the advice impressively thorough and helpful. It is supported by a good range of encounters or mortal foes, wild beasts, monstrous foes, and otherworldly horrors for the Game Master to use in her campaign, plus write-ups of some of the major characters from Howard’s Conan stories including the eponymous protagonist himself. The encounters are categorised as minions, toughened foes, nemeses, and horrors, and should provide plenty of opposition for a Game Master in the initial stages of her campaign. As should a sample set of NPCs, though they can also work as allies or even sample player characters. Rounding out the roleplaying game is the adventure is ‘Vultures of Shem’, which starts with the player characters standing in the middle of a battlefield after their side has been defeated and goes from there. It is a good set-up, gets the characters and their players involved quickly and should provide a couple of good sessions worth of play. Physically, Robert E. Howard’s Conan: Adventures in an Age Undreamed Of is a sturdy hardback, liberally illustrated throughout with scenes from Conan’s adventures and the Hyborian Age. For the most part, it is very well written, the section on gamer mastering in particular, being very good. There are sections in the gazetteer which feel horridly overwritten and there is nothing to really ground either player or Game Master in the setting after the introduction before the writers start on character generation and the rules. At its heart, Robert E. Howard’s Conan: Adventures in an Age Undreamed Of is quite a simple game, the 2d20 System being relatively straightforward and easy to understand. Unfortunately, with the addition of the rules for Momentum and Doom, the complexity of the rules ramps up. 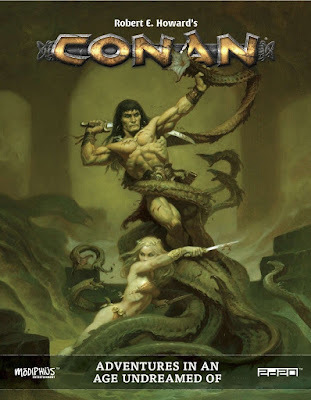 The problem with this is adjusting to and learning just what the Momentum mechanics can deliver and enable the larger than life style of play which Robert E. Howard’s Conan: Adventures in an Age Undreamed Of is designed to deliver as a roleplaying game. The learning curve feels greater than it really should be and that may be off-putting for some players. There is a focus upon combat in these rules, particularly for Momentum and Doom, but that is to be expected for what is to be designed to deliver a larger than life, pulpy, action-orientated roleplaying experience. Robert E. Howard’s Conan: Adventures in an Age Undreamed Of promises lurid sensationalism, exotic locations, bold adventure, weird menace, fearless action, and more. It certainly delivers on that promise and the 2d20 System certainly feels suited to the stories of Robert E. Howard’s Conan.